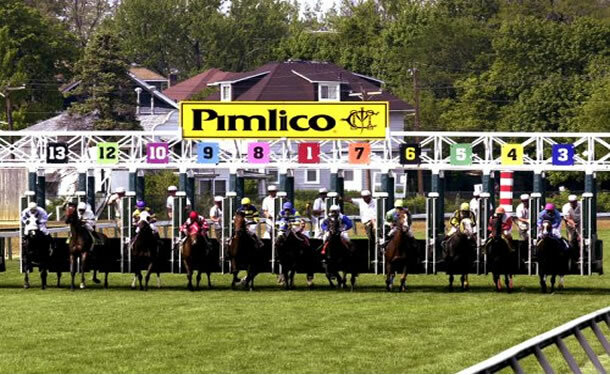 Kentucky Derby winner American Pharoah is getting most of the attention in the wagering for the $1.5 million Preakness Stakes coming up on Saturday at Pimlico Race Course. Trained by Bob Baffert, the colt is currently at betting odds of 10-13 at Bodog and seems certain to go off at less than even money in the second jewel of the Triple Crown. The colt has now won five races in a row, holding off Firing Line by a length to give Baffert his fourth win in the Run for the Roses. His previous three winners were Silver Charm (1997), Real Quiet (1998) and War Emblem (2002), and each of those Derby winners were successful in winning the Preakness two weeks later. The colt will face seven foes on Saturday afternoon, with four exiting the Kentucky Derby including runner up Firing Line and his stablemate Dortmund, who weakened to finish third. Firing Line is at betting odds of 17-4 and Dortmund is at 15-4 on the latest odds released by Bodog. The two others exiting the Derby are fifth-place finisher Danzig Moon, who is at odds of 14-1, and Mr. Z, who is currently 25-1 at Bodog. Cooolmore Lexington winner Divining Rod appears the most talented among the three newcomers to the Triple Crown trail. The colt is at betting odds of 20-1. Bodhisattva is the one runner in the field that has a race over the Pimlico main track. The colt won the local prep, the Federico Tesio Stakes on April 18. His odds are currently at 50-1 at Bodog. Completing the field is outsider Tale of Verve, who broke his maiden in his last outing at Keeneland on April 23. It was his sixth career start and he looks completely overmatched stepping into Grade 1 company. Post time for the Preakness Stakes is 6:18 ET and will be televised live on NBC.